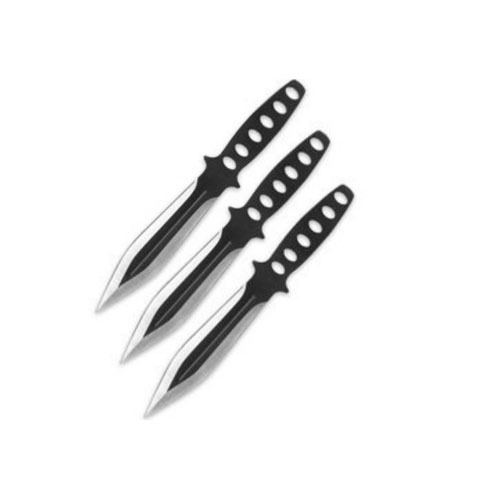 This item provides you with a super set of throwing knives at price you can?t pass up! Each knife measures 8" overall and offers one solid piece of stainless steel construction with a combination black and silver finish. The 4 1/2" double edge blades with narrow blood grooves offer excellent weighted balance to ensure point penetration. The handles features cut-outs to assist in stabilizing throws and providing a sure grip. This set includes a black nylon belt sheath. Tomahawk, XL1201.